Supernatural Season Thirteen brought us some new characters, some old, and some brought back from the dead. It brought us an alternate world and showed us power so supreme that we can only wonder how the writers, producers, and directors will top it. Can you imagine a world without the Winchester Brothers- or their car? Supernatural Season Thirteen, like any suspicion of the same number, centers on what the world would have been like if the Winchester brothers had not been born. Season Thirteen introduces us to a world without the Winchester Brothers- Sam (Jared Padalecki; Gilmore Girls and Dean (Jensen Ackles; Dawson's Creek), our favorite angel, Castiel (Misha Collins; Girl, Interrupted), dead, and Lucifer's son, Jack (Alexander Calvert; Arrow), fully grown. In the alternate reality, an apocalyptic world, Mary Winchester (Samantha Smith; Transformers) is trapped in the alternate reality with other universe Michael (Christian Keyes; Saints and Sinners) and our reality Lucifer (Mark Pellegrino; National Treasure), whose only goals are to find a way to the "real" Earth and reality, so they can roam free and take over the world. What may surprise the audience is how good Lucifer's son, Jack, can be in the show. What we need to remember is that Lucifer himself wasn't always inherently evil- he was a favorite angel of God who simply fell to Earth to rule the Underworld. With that in mind, no wonder Jack is a tableau roso. He chooses Castiel as his father but when he is told that Castiel has died, Jack flounders. As usual, the Winchester Brothers differ on what to do with the instantly grown teenager, Jack. Characteristically, Dean wants to kill Jack. Sam, as always, sees the potential of goodness in Jack and basically "raises" Jack and tries to help him with the great powers with which Jack was born. This sets the background to Season 13, which emphasizes the battle between good and evil. Despite the fact that Jack is really a good guy, blood is always thicker than water and when Jack must make a choice between adopted dad Sam and bio dad Lucifer, Jack chooses to give Lucifer a chance. As usual, Lucifer cannot overcome his evil and slits Jack's throat to obtain Jack's powers at the end of the season. Clearly, there is no family bond for Lucifer like there was for Jack. We can't fault Jack for this, as he has been seeking a father figure the entire season. I can't fail to mention that Jack's powers are so strong that he raises our beloved Castiel from the dead in episode four, "The Big Empty" seeking his father. A unique feature to this season was the highly anticipated Scooby-Doo and Supernatural animated crossover, entitled Scoobynatural (Episode 16). For those of us that watched Scooby-Doo as children, it was a great experience to watch Dean, Sam, and Castiel drop into the world of our favorite mystery gang to solve a crime. In true Scooby form, the animation was not upgraded but done exactly the way we watched Scooby-Doo in the ‘70's. What's surprising is for those of us with kids who are Supernatural fans may have realized that our kid's excitement about this fantastic episode clearly outweighed ours! Supernatural: The Complete Thirteenth Season is presented in 1080 High Definition with an aspect ratio of 1.78:1. There are parts where the color is bright and natural and other where the color is dark and dismal. This is in no way a fault of the presentation; in fact, it is a compliment to the digital presentation. Supernatural is a series wherein the colors seem to depend on who the Winchesters are fighting, who is after them, and the outcome of the battle. The deep blues, purples, and blacks contrast with the golds and whites in scenes, specifically to provide the audience with cinematographic foreshadowing as to what they can expect in that scene. The audio is presented in DTS-HD Master Audio which provides a nice balance between the fight scenes and the dialogue scenes. You can still hear Dean's car as it starts up or the radio clearly without having to turn up the volume to hear the conversation. While Dean and Sam are two brothers that couldn't be closer, it is still amusing to hear their sighs of annoyance when they think the other one is making a bad decision. The Blu-ray and Digital HD comes with many bonus features that help answer a lot of questions sifting through our heads. Disc 1 has an unaired scene in Episode 3: Patience and contains Episodes 1-6. Episodes 7-12 can be found on Disc 2 and all except Episode 9 has an unaired scene. Disc 2 also has a Special Feature Into the Apocalypse: A World Without The Winchesters. Here, you can see how the alternate reality was brought to life. Disc 3 contains Episodes 13-18, including the Scoobynatural episode, unaired scenes in Episodes 14,15, 16, and 18. This disc also has a Special Feature entitled Mystery Mash-up: The Making of Scoobynatural. The last disc, Disc 4, contains the remained of the Episodes 19-23. 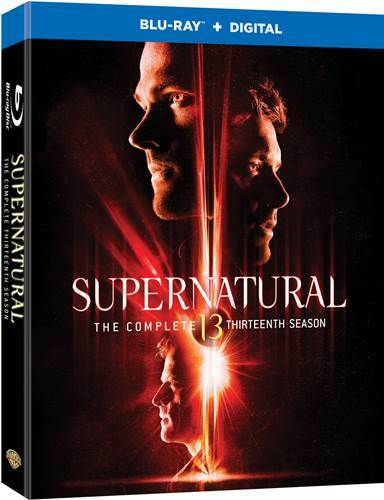 None of those episodes have unaired scenes, but there are four Special Features on this disc, namely: The Winchester Mythology: Nature vs. Nurture; Kansas Performs "Carry on Wayward Son" (besides the concert presentation, this includes conversations with cast and producers); Supernatural: 2017 Comic-Con Panel; and Gag Reel. When The CW agreed to fund Supernatural as long as Jared Padelicki and Jensen Ackles want to continue reprising their roles and ratings stay up, CW President Mark Pedowitz said "…the best thing I can do for the guys, and for the studio, and for the showrunners is basically make sure we don't mess them up." (Variety Article online, Laura Prudom, 9/21/2016). Supernatural is heading into their fourteen season, riding the tails of what was a spectacular thirteenth season and Pedowitz is clearly supporting the entire cast of Supernatural as the writing and acting only seem to get better with each episode. With the ultimate cliffhanger at the end of Season Thirteen as Michael roams the real world in Dean's body, what havoc will Warner Bros. bring us next and how will Sam save Dean? Season Thirteen brought us some new characters, some old, and some brought back from the dead. It brought us an alternate world and showed us power so supreme that we can only wonder how the writers, producers, and directors will top it. Download Supernatural: The Complete Thirteenth Season from the iTunes Store in Digial HD.